When people feel they are not being represented—that their voices and experiences don’t matter, when they feel there is a great wrong in the world, and when they have simply had enough—they often take to the streets and march. Increased acts of civil disobedience rose around the world after Percy Shelley’s poem The Mask of Anarchy and an essay by Henry David Thoreau in the 19th century became popular rhetoric with freedom movements of the 20th century. Protestors increasingly took to the streets: Ghandi in 1930 for the great Salt March; protestors opposing apartheid in South Africa; students demonstrated for weeks in Tiananmen Square in 1989; the Arab Spring Protests in 2011; and more. While civil disobedience at its root is based in nonviolence, protesters often risk harm and even death when those in power decide to respond. Across the U.S., protest movements are both an integral part of our past and how we display our opposition to conditions of the day. In our very recent past, protesters have taken to the streets from Ferguson, Missouri in 2014 to Standing Rock in North Dakota in 2016. Peaceful protest is a tool that Americans continue to use across all states in order to give a voice to those who feel they are not heard. But, no location features as prominently for protest movements in the U.S. as Washington DC. 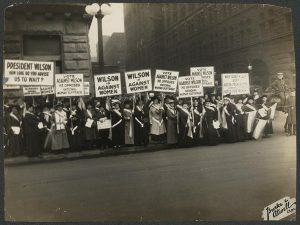 Suffragists marched on Pennsylvania Avenue in 1913 for access to the vote. Infamously, large numbers of KKK members turned up to march in DC in 1925. Throughout the Vietnam War, protesters marched on Washington in both opposition to the ongoing conflict and conversely—though in much smaller numbers—in support of Nixon. In 1993, possibly the largest peaceful U.S. demonstration was the March on Washington for Lesbian, Gay and Bi Equal Rights and Liberation. The largest distance covered to protest was the 1978 Longest Walk from San Francisco to DC in objection to increasing legislation that threatened tribal land and water rights. 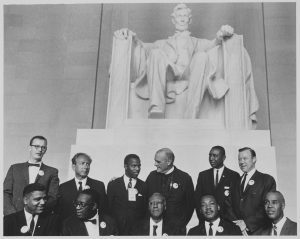 Civil rights movements are some of the most prominent for making Washington DC their target in the 20th century. The Black Panthers and Louis Farrakhan have called on the leaders of the U.S. from the Mall to legislate to improve conditions for Black Americans. 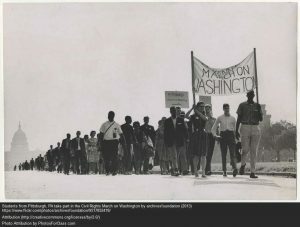 And certainly one of the biggest and most diverse marches was the March on Washington for Jobs and Freedom in 1963. Although Martin Luther King Jr. helped lead many marches around the U.S., it was the sweltering August 1963 march in which he delivered his unforgettable Dream Speech that is etched as a cornerstone in American history. While marches and rallies in opposition to government were once seen as actions by radicals—every move by Martin Luther King was tracked by the FBI, after all—it has become an increasingly acceptable public show of a group’s objection to government. Current marches of the day include an annual March for Life in opposition to Roe V. Wade and the Rolling Thunder annual motorcycle rally to support and give voice to veterans and POWs. On January 21, 2018, many have committed to attend the Women’s March: Power to the Polls, which will launch a national voter registration tour one year after the historic Women’s March on Washington. People have marched on Washington DC for over a century now in order to give a voice and show of solidarity when they feel that their needs and rights are not being heard or responded to by those who legislate. The ability to be seen and heard and march for that in which we deeply believe is an important aspect to how we peacefully attempt to display our dissent. On the Salt March : the historiography of Gandhi’s march to Dandi by Thomas Weber. Get Smart: a Quiz & an Event on March 31! Respect people voices around the world.